For one week this summer I hosted “sleep away” camp for my 5-year old and 7-year old grandsons. During the day they headed to zoo camp, and after/before camp they slept, ate and lived with us in our Seattle condo. This was our second annual grandparent camp, and it was perfect because I live close to the zoo, and my husband and I divided up the driving. Our daughter lives a half hour away in good traffic and there was simply no way she could have the boys in camp on time, particularly with work schedules and a six month old in tow. This was my week to be a superhero grandma and it was their week to give their 6 month old baby girl some individual attention. We live right in the heart of Seattle within two walkable blocks of a great sushi restaurant, a pho restaurant, countless pizzarias, ice creameries, and grocery stores. We usually go out with the kids one night for dinner, but I love to cook and to make food memories with them . The boys helped me plan menus, pack lunches and cook breakfast and we ate together every night — just the kids with their grandmother and grandfather. What could be better? I like to plan a little ahead of time so that during the day while they were in camp, I wasn’t consumed with grocery shopping and food preparation. 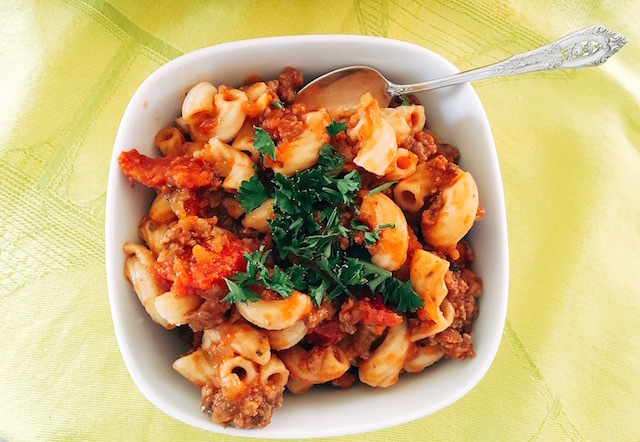 So, the Friday before they arrived I was culling my “to try” file of recipes (Yes, I actually have such a file) and decided to combine some ideas and try a one-pot make-ahead pasta and meat dish that seemed very kid-friendly. The night before I actually did the cooking, I finely chopped the mushrooms, onions and peppers in my food processor because I know the boys are less likely to eat dinners where they can actually identify these vegetables. And I had everything else I needed on the counter, ready to go. The next morning, it took me 45 minutes or so and I ended up with a huge pot of meat and pasta, enough for four meals. This recipe requires only one pot to cook in and to clean – you gotta love that. Ka ching! Three containers were filled, dated, labeled and put in the freezer for future consumption, and one stayed in the fridge for a dinnertime meal and packable lunch box item. I let both boys sample the final dish before freezing it, and they both gave it a huge thumbs up. The 5-year old said he would love to pack it and eat it room temperature for camp lunches. Done. Not only is this kid friendly…the adults truly enjoyed it. My husband loved it because it was moist and “really really good.” I’ll keep this one-pot meal in mind for when I want to cook and bring food to a neighbor, a new mom or anyone else who needs a little TLC. It might remind you of Hamburger Helper but it is SO MUCH BETTER! Oh, and I put some of this in my Nutribullet to make baby food for the 6-month old who loved it as well. In a large 5 qt. Dutch oven, crumble beef and lamb over medium-high heat and cook until it is no longer pink chopping it up so it doesn’t stick together in hunks. Drain fat but don’t wipe out the pan or remove the meat. Add the chopped onion, green pepper and mushrooms. Cook until soft, about 3-5 minutes. Add in garlic, water, tomato sauce, tomatoes, basil, oregano, paprika, sugar, crushed red pepper flakes, Worcestershire sauce, salt and pepper. Bring to a boil, cover and reduce heat to medium-low. Allow to simmer for 20 minutes, stirring halfway through. Remove the lid and add the dried pasta and stir well. Return lid and continue to simmer for 15 minutes or until the noodles are done, checking and stirring every five minutes. Note that whole wheat pasta might take a bit longer to cook. Once the pasta is al dente, remove from the heat (it will still appear to have too much sauce) and let it remain covered for 10 minutes to finish absorbing the juice. Stir well before serving. You could give this a Vietnamese twist by subbing fish sauce for worcestershire, and adding fresh mint, basil and cilantro with a squeeze of lime. You could garnish this with some fresh oregano leaves, feta cheese and diced kalamata olives for a Greek flair. I’m sure ground chicken would taste lighter but wonderful if you aren’t anxious to use beef or lamb. Fresh grated parmesan cheese would be nice on top here but by no means does it need it. We ate ours naked..no cheese. No, we weren’t naked! But of the three bins I have in the freezer, I will make each meal a little special with one of the above tweaks. This entry was posted in Meat and tagged Beef, Lamb, Meat & Pasta Stew. Bookmark the permalink.